100% ownership. Unlimited lists/subscribers. Zero recurring fee. Are You Paying A High Recurring Fee For Your Autoresponder? Yes, you've got NO choice! You'd need it to build your lists - your most important online asset. But what if you can set up your own tier-1 autoresponder ... and it's literally FREE?! Your dream has finally come true today. Without having to worry about paying ANY kind of fees ever again! Then believe me, I can understand your frustration. You just wish these monthly fees would go away for good! The bigger your list grows, the greater the fees you're forced to pay every month just to continue using the email autoresponder. When you're just starting out with a small list, you're paying $19 per month even though you may not be making much money (or any money at all) with your list. And once your list grows to a decent size of 2500 or more subscribers, you're immediately staring at $49 ... $69 ... $149 in monthly recurring fees! Because if you're like most email marketers, an autoresponder isn't the only thing you need to spend money on. What about your squeeze pages? Chances are, you've to pay a web designer every time you want to create these landing pages ... and the cost can add up FAST. Or, you may choose to use a landing page software like Leadpages, Instapage or ClickFunnels, which once again adds to your monthly expenses. If only all these hefty fees didn't exist, right? Imagine how much faster you can build your email list ... if you could instead invest all that money on more important things like marketing, solo ads, outsourcing, and even product creation. Think about how much dollars you can save ... if you no longer had to pay for these expensive software that charge you monthly. Now you can keep 100% of the profits you make as your list grows. Or any of the other email autoresponder companies that bill you monthly. ... Or any of the other expensive landing page software ever again! How I Developed This "All-In-One"
And I'm an internet marketing trainer and web developer. You see, over the years of teaching people how to make money online with email marketing, I found one big problem that kept coming up again and again. My students quickly found themselves having to spend money on an email autoresponder, landing page software, outsourcing and so on, just to get started with list building. They are immediately burdened with fees (which many cannot afford) because there was no other way! And what's worse, with each passing month, these expenses continue to drain their savings. It's no wonder many ambitious marketers give up on list building before they can even begin to experience success. I'm happy to say that I've finally discovered the perfect list building & email marketing solution that eliminates ALL costs. It turned out to be so successful, that I closed my Aweber and GetResponse accounts during this period of time, and I now build and manage my email lists purely with this brand new solution. In fact, my marketing clients are paying me up to $1,000 to set up this system for them. Because, like many marketers and businesses, they are sick and tired of paying hundreds of dollars, month after month, on unnecessary list building expenses! And they want a better, more affordable solution. 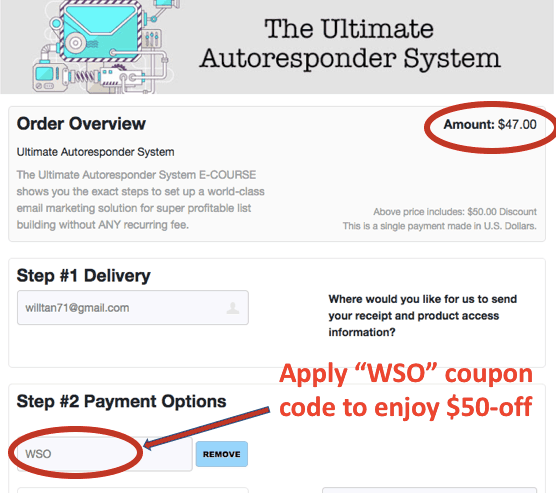 The Ultimate Autoresponder System (UAS) is a step-by-step E-COURSE (with detailed screenshots) that shows you how to setup the ideal autoresponder and email marketing system - in under an hour. You will get everything you need ... including 2 PREMIUM PLUGINS AS BONUSES, which means you won't need to spend an extra single cent. Because you can create world class, high-converting optin forms, squeeze pages and landing pages WITHOUT the high recurring fees. With the Ultimate Autoresponder System (UAS), you get a complete LIST BUILDING, EMAIL MARKETING and LANDING PAGE builder all-in-one. Which means UAS is the only email marketing system you will ever need to build a hugely profitable list. 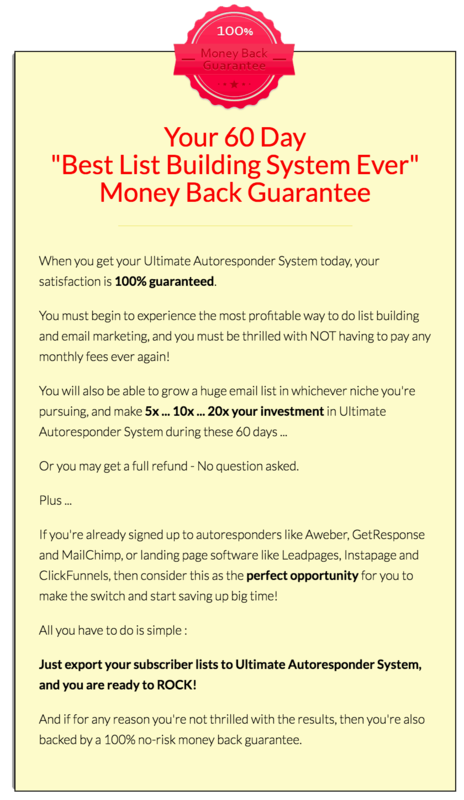 Since Ultimate Autoresponder System is "ALL IN ONE", it is perfect for new list builders as well as experienced email marketers who are looking to migrate their current lists to a much more affordable and just-as (or even more) powerful solution. Now, I know you can't wait to see UAS in action. Then you'll find Ultimate Autoresponder System has EVERYTHING ... you need to run your profitable, sustainable, scalable online business. Because I want UAS members to be the most successful email marketers on the planet, you'll also get an exclusive Part 2 - "Using the Ultimate Autoresponder System Like a PRO" that reveals the best email marketing tips, techniques and strategies today. And get subscribers buying from you over and over again! More importantly, as your list grows, this step-by-step guide serves as an important reference to generating hundreds and thousands of dollars each time you send out an email. Since the Ultimate Autoresponder System is a powerful E-COURSE (not a rigid ebook! ), you'll get UPDATES of the latest list building secrets to ensure you're always ahead of the game! JUST APPENDED with Part 3 : Case Studies - Do It Like The PRO showcasing how the PROs implement their autoresponder strategies; so we can also model them to achieve results and success. This will allow you to dominate your niche, maximize your profits, and save you thousands of dollars on email marketing courses over the coming years. In other words, now you'll be able to build a "lifestyle business" that can provide you and your family with a truly comfortable lifestyle. In fact, I'm so confident you'll find UAS indispensible that I'm going to shoulder all the risk for you with a 100% money back guarantee. ... when now you don't have to? Then the Ultimate Autoresponder System (UAS) will change the way you do email marketing. Start building your profitable list today, and never look back! Just click on the button below to get The Ultimate Autoresponder System E-COURSE now! Enter discount code : WSO to enjoy a $50-off when you checkout at JVZoo. Exclusively for Warriors only! P.S. Remember, the Ultimate Autoresponder System E-COURSE comes with a 60 day full money back guarantee, so you've everything to gain, and absolutely nothing to lose. P.P.S. UAS is meant to be set up in WordPress sites only. Is it safe to set up autoresponder from within WordPress? Yes, I’ll show you step-by-step in the E-COURSE how to set up a world-class autoresponder system in your WordPress site that you have 100% full control (of your own lists and email marketing) without any risk to your hosting account. How many subscribers and lists can I have with UAS? How many emails can I send? You can have UNLIMITED subscribers and lists. I’ll also show you how you can send thousands (and thousands) of emails (literally) for free. I’m a total newbie to hosting, WordPress etc. what if these are too technically difficult for me? Although the detailed step-by-step procedures on how to set up the Ultimate Autoresponder System are rather newbie-friendly, it’ll be definitely an advantage if you are familiar with cPanel and WordPress. That being said, if you encounter any technical hurdles, help is just a ticket away at https://WillTan.com/support. I already have an existing autoresponder/list, can I migrate to this Ultimate Autoresponder System? Definitely! I’ll show you how to migrate your lists from existing autoresponder like Aweber or GetResponse to the Ultimate Autoresponder System. does this offer still work today ?? as i tried to buy but link just keeps spinning. You say send 1000s of emails. How many per day could I send for free? Hi Brian, we'll be using 3rd party email service (and we're not limited to one), hence, sending 6-figure emails monthly for free is not a problem. It's the setup and the way we send emails (which is covered in the E-COURSE) that are important. Anyway, most email service will queue the emails for sending ... so if there is a need to send such high amount of emails ie. mega launch, it will be good practice to have progressive email campaigns over a period like days or even weeks. P.S. If there really is a need to send super high amount of emails ie. 1-mil in one go, I can show you the LEAST cost to get this done. On using SMTP to send emails - that would be a big NO. If you're sending a dozen emails a day, SMTP is still okay but when your lists grow, it will cause problem to your hosting account as most hosts have sending limits and they are infamous to be blacklisted by spam filters (after all, they account for 80% of world's spams). ... to showcase how the PROs implement their autoresponders - this will allow us to model their success. Do you have a live landing page where I can sign up to see the form and formats of the thank-you pages and emails etc? Hi Jeff, sure. You can try the Subscribe Now at the frontpage of https://WillTan.com or the optin form at the sidebar when you go to https://willtan.com/blog/. And if you go to any of the blog post, you can see the cool sticky slide-in forms. Anyway, you can check out the Submit Now button at the frontpage of https://WillTan.com. Or you can try the optin form at https://WillTan.com/blog ... and if you click into any post, you'll see a cool sticky slide-in opt-in form. Do we need to setup our own smtps or we need to integrate with services like sendgrid, etc? Hi faridbeck, we'll not be using SMTP as most hosts have sending limits and are often blacklisted by spam filters since they account for 80% of world's spam. The E-COURSE will show you the detailed steps on the proper way to set up email service(s) which you can send thousands and thousands of emails which don't cost you a single dime. P.S. Unless you'd need to send like 1/2-million emails every month, even so, I can show you the LEAST cost ever to get 'em delivered reliably. Ok...but will the emails end up in the inbox or spam box. I understand it's very difficult to inbox emails to gmail. No worry, the E-COURSE covers the proper set up of bounced email and configuration to ensure sending reliability. I am confused this autoresponder of yours costs $97 one time or what? to get the Ultimate Autoresponder System E-COURSE at $47 (one-time). And yes, the E-COURSE will show you, step-by-step, on how to set up a tier-1 autoresponder system which you can have unlimited subscribers and lists. For support, please register/submit a ticket at https://WillTan.com/support. Please be patient after ticket submission. I'll usually reply to all tickets within 2-business day. Thank you.